It was a cold dreary dawn and my plans needed to subtley change to make the most of the conditions encountered. Despite the softly falling rain and the low contrast I had a big smile on my face as I had already envisaged a shot, I doubt the rest of the group I was leading had any idea of the magic that was in store for them. 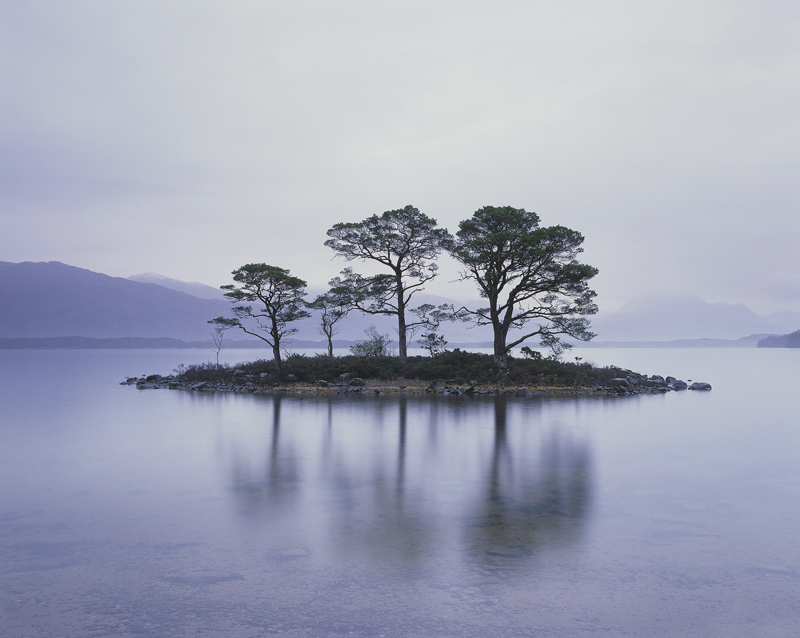 The low water meant access to the island along the shore was a viable proposition and the soft contrast and dawn blues emerging from twilight with Slioch disappearing into the mist would create a gloriously simple understated scene which I trusted would satisfy the group as much as it did myself. A touch of polarisation revealed detail below the surface water and a relatively long exposure served to glaze over the water surface and reveal the tree reflections.